The Rocket Competition team is designing and constructing rockets and a payload to compete in two events in the Battle of the Rocket Competition. For the Target Altitude event, a rocket that can reach exactly 1,625 feet using a G motor has been built. The Planetary Rover event will require the construction of a rover and rocket system which can be launched to at least 1,000 feet on a K motor. The rover be contained within the 11 foot tall, 7.5 inch diameter rocket during its ascent, and will be released with its own recovery system to land and perform a series of tasks on the ground. The competition will be held on March 28th in Culpeper, Virginia. In this core YUAA project, members of all levels of experience come together to encourage interest and develop experience in rocketry, aerospace and engineering. Members will gain experience with engineering tools and construction techniques, including laser cutting, electronics and circuitry, CAD software modeling and much more, as well as non-technical skills including documentation and design reviews, which are applicable to any future engineering project members may undertake. 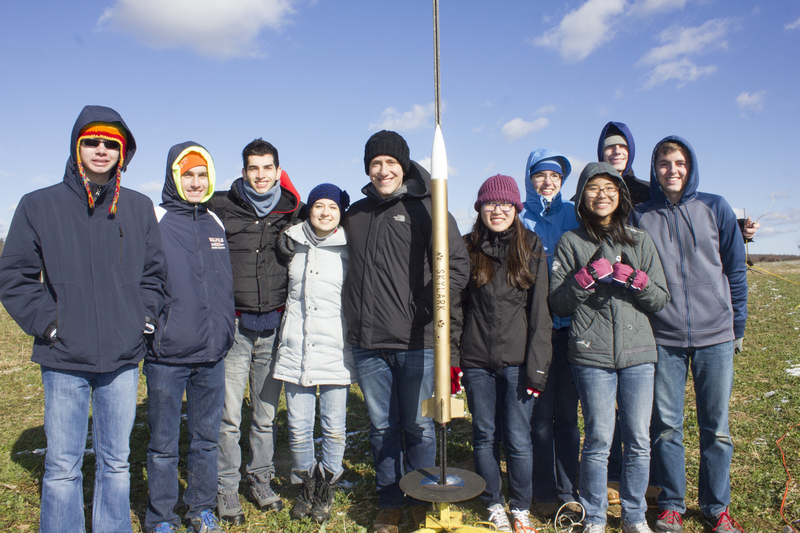 In mid-November 2014, the rocket competition team tested “Skylark”, their final for the 2015 Battle of the Rockets Target Altitude Competition. The goal of the competition is to come as close as possible to a peak altitude of exactly 1,625 feet. 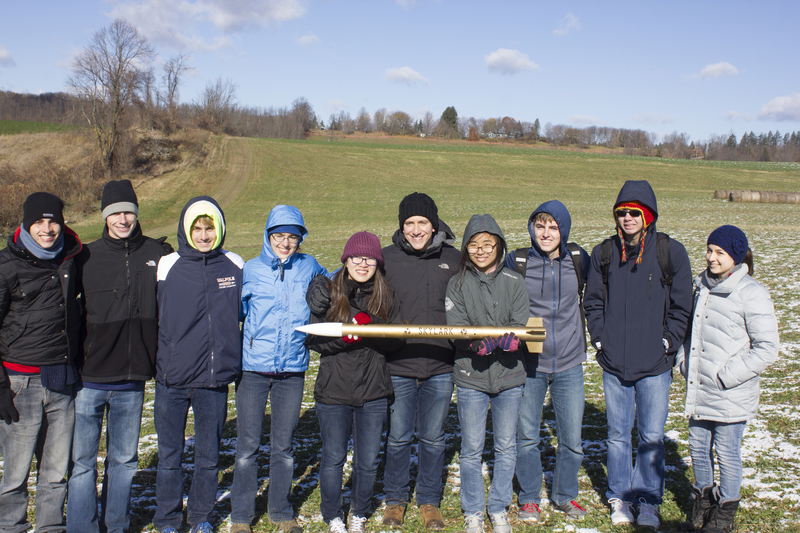 Many YUAA members went out to the fields of Cobleskill, New York for the test launches. 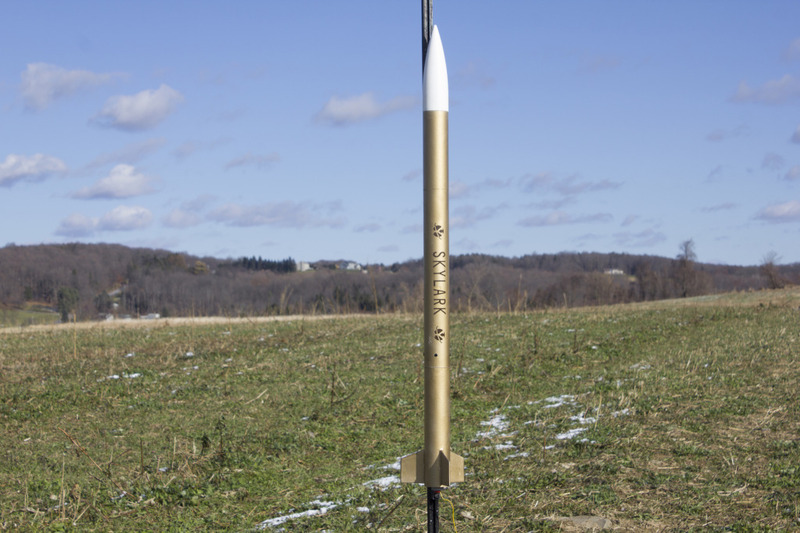 In the launch, the gold-colored rocket Skylark fought against growing winds to reach an altitude of roughly 1,280 feet before deploying its parachute and gliding back to the earth. The Rocket Competition team members have begun the 2015 spring semester with much enthusiasm. They are now focusing on building the final Planetary Rover event rocket, which will be 11 feet tall and 7.5 inches in diameter. Additionally, they have been working on the final rover payload, which will deploy out of the rocket for the competition later in 2015. The team’s rover design is simple and lightweight: one wheel on each end of a wide body section with a stabilizing tail. They intend to construct the frame out of aluminum, use spiked high-traction wheels to navigate through rough terrain, and have the tail unfold once the rover is released. Watch their prototype rover navigate over some tree roots! The chassis is a simple rectangular prism chosen for ease of manufacturing. The prototype chassis was constructed from lasercut plywood, while the final design is expected to be constructed from plywood and aluminum, contingent on rigidity and strength testing. The prototype wheels were made with foam core, but the final material is prospected to be rigid acrylic plastic. Lastly, the prototype tail was 3D-printed thermoplastic, but the final tail will be spring-loaded, folding into the body. Lucia Korpas is the Rocket Competition team leader. She is a Branford sophomore majoring in Mechanical Engineering, and worked on the Competition Rocket team her freshman year.